SEOUL (Reuters) - A South Korean court on Thursday dismissed an arrest warrant against the head of Samsung Group [SAGR.UL], the country's largest conglomerate, amid a graft scandal that has led to the impeachment of President Park Geun-hye. But the reprieve for Jay Y. Lee, 48, may only be temporary, as the special prosecutor's office said it would pursue the case. Lee, who has led Samsung since his father, Lee Kun-hee, suffered a heart attack in 2014, was still likely to face the same charges of bribery, embezzlement and perjury, legal analysts said, even if he is not detained. Lee left the Seoul Detention Centre carrying a white shopping bag and climbed into a car without talking to reporters, having been held overnight as the court deliberated whether to grant the arrest warrant. The special prosecutor's office said it would be continuing its probe but had not decided whether to make another arrest warrant request, and the setback would not change its plans to investigate other conglomerates. Spokesman Lee Kyu-chul said the prosecution was unconvinced by the Samsung chief's argument that he was a victim of coercion due to pressure from Park. 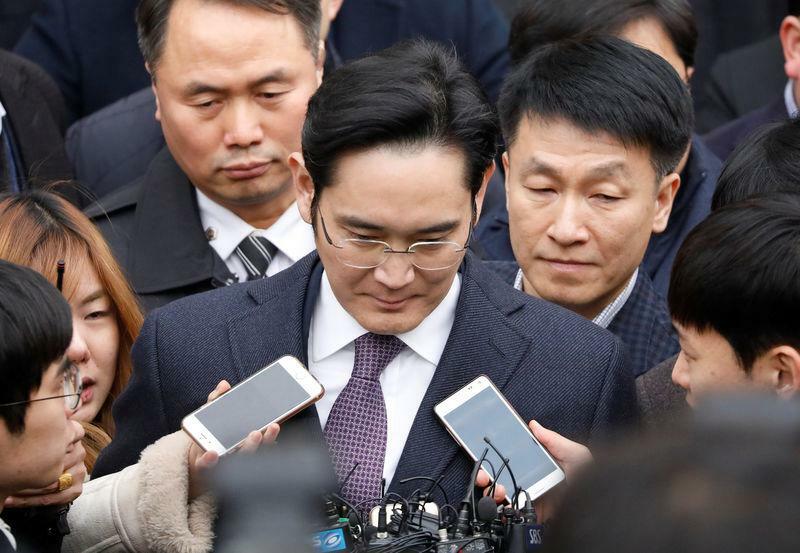 The spokesman also said Samsung Group Vice Chairman Choi Gee-sung had been classified as a suspect on suspicion of bribery, but did not elaborate further. Two other Samsung officials, Choi's deputy Chang Choong-ki and Samsung Electronics executive Park Sang-jin, were also under investigation. The office has accused Lee of paying multi-million dollar bribes to Park's confidant, Choi Soon-sil, the woman at the heart of the scandal, to win support from the National Pension Service for a controversial 2015 merger of two Samsung Group affiliates. The merger helped cement Lee's control over the smartphones-to-biopharmaceuticals business empire. He has denied wrongdoing. The judge said in a statement on his ruling that an arrest was not necessary - for now. "After reviewing the contents and the process of the investigation so far ... it is difficult to acknowledge the necessity and substantiality of an arrest at the current stage," he said. Lee Jung-jae, a lawyer and former prosecutor, said he didn't think the special prosecutor would push for Lee's detention again. "They probably already have as much evidence as they could gather," he told Reuters. "They will indict him eventually, but without detention." Samsung said in an emailed statement that it appreciated "the fact that the merits of this case can now be determined without the need for detention". The group's flagship, Samsung Electronics <005930.KS>, is the world's biggest maker of smartphones, flat-screen televisions and memory chips. Making its case for an arrest warrant on Monday, the special prosecutor's office accused Lee of paying bribes totalling 43 billion won ($36.70 million) to organisations linked to Choi to secure the 2015 merger of Samsung C&T Corp and Cheil Industries Inc.
Park, 64, was impeached last month by parliament over the influence-peddling scandal. If the decision is upheld by the Constitutional Court, she will become South Korea's first democratically elected leader to be forced from office early. Both Park, who remains in office but stripped of her powers while the court decides her fate, and Choi have denied wrongdoing. The special prosecutor's office said on Tuesday it had evidence that Park and Choi shared profits gained through bribery payments, but did not elaborate. This week, the special prosecutor indicted the chairman of the National Pension Service, the world's third-largest pension fund, on charges of abuse of power and giving false testimony in relation to the deal. Thursday's court ruling angered many, including members of the left-wing opposition Democratic Party, which said the decision ran counter to public sentiment. Samsung and its leader have been dogged by protests in recent weeks as the graft probe advanced, with some calling for Lee's immediate arrest. "The law is not equal for all," one South Korean remarked on web portal Naver. Key Samsung Group shares rose following the court decision: Samsung Electronics and Samsung C&T gained 1.5 percent and 0.8 percent, respectively, outperforming a 0.1 percent gain for the broader market (.KS11) though down from their opening peaks as investors braced for the likelihood of an indictment. "The only thing that has changed is that he won't be detained now," commented Park Jung-hoon, a fund manager at HDC Asset Management, adding that uncertainties were likely to linger.